DIY / Simple, Cheap, Reusable Silk Screen! Admit it, we all love tote bags. How many do you have? I have about a bajillion, and I am ok with that! I have been wanting to learn to silk screen for a while now, and i actually do have an actual class coming up, but what if you just wanted to whip up a quick design on a few items. Maybe make favors for something? Having a craft sale? So how do we create a repeated custom design? The above examples is SUPER EASY and I know you could just use stamps, but we are keeping it simple here just so you can see the process. This will work with a more complicated design or your choice! When you are done with your screen, you will be able to wash it with just water and save for your next run. How. Freakin. Ace. Is. That. SUPPLIES / Fabric Paint, Paint Brush, Scissors, Marker, Outdoor Mod Podge, Stockings (I used super cheapo ones), Embroidery Hoop (8 inch pictured), and a Canvas Tote (I scored these babies for $1 each!) or really any fabric you want - a shirt? pillow case? ANYTHING! 1 / Cut your stocking into a square and stretch over your embroidery ring. 2 / Draw your design directly onto the stretched stocking. If the direction your design is matters, lay the flat, stocking side of the ring down, that is how you will have to lay it to apply the design your bag! 4 / When the screen is completely dry, lay the stocking side down onto your fabric. 5 / Apply the fabric paint to the design. 6 / Carefully peel back the screen. It ain't going to be perfect, but its perrrrrrrty good. 7 / Run the screen under water and it comes clean for reuse whenever you want. Its super easy to make as many bags as you want out of this because it washes super clean so easily! I AM SO EXCITED TO TRY A MORE COMPLICATED DESIGN USING THIS METHOD! 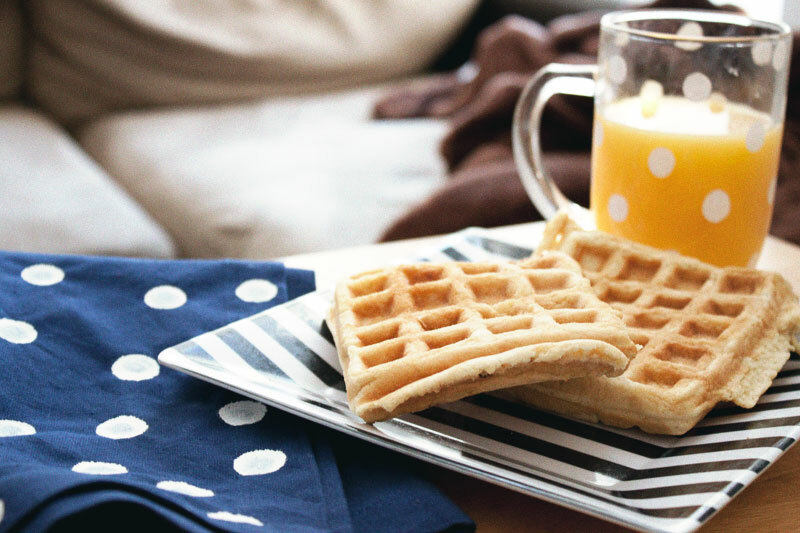 So easy, so cheap, and so perfect! What do you think we should screen next?! Now that the holidays are over, I can show you all the fun gifts I made my friends and family! It was super fun to get creative this year and make things I thought everyone would love (and make myself some items along the way!). I had been seeing some uber cute stamped fabrics lately in the blogosphere. Did you know you can stamp using POTATOES!? Learn a new dang thing a day! I wanted to start simple. I've seen where you can use a cookie cutter to help get your shape , and I will definitely be trying that soon. But it was my first time, so I kept it easy-breezy. Fabric / The fabric and size is up to you. Over on Design*Sponge they created a no-sew scarf, you just have to choose a knit fabric that won't fray so you don't have to finish the edge. I chose a comfy sweatshirt material because of who I was making it for, she loves to be comfy. I cut a 72 inch long x 20 inch wide piece. Keep in mind, some fabrics will curl up a bit on the edge. Potatoes / I chose firm, large potatoes because I wanted a big- 'ol oval. Fabric Paint / Make sure you take into consideration the color of your fabric. I wanted a super bright color, but because my fabric was dark, it didn't come out exactly as I pictured it, but it still looked great. Extras / A Knife to cut your potato, an iron to set the pattern, a scissor to cut the fabric to size, a small paint brush and a paper plate for a paint palette. If you want an infinity, you will need to sew the fabric into a huge circle using a machine or a lot of patience and a needle & thread. Cut the potato in a nice, clean slice. Make sure you cut it so that you can hold on to it firmly when you start stamping. 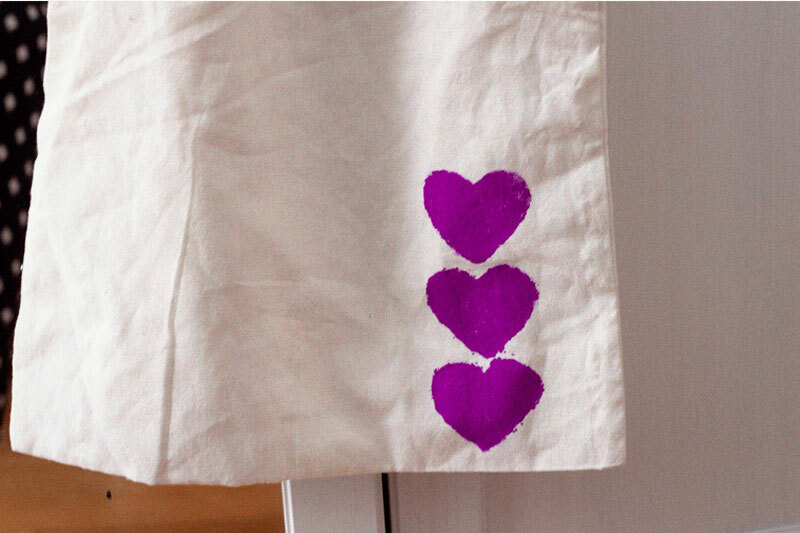 Don't forget to test out your stamp on a scrap piece of fabric. Look how cute! Stamp away! I went back in with a paint brush and evened out the paint along the edge. When you press down the stamp on the fabric, the edge will get a bit extra, just go in with a brush (or a q-tip or your finger) and even it out so the color is even and it dries evenly. After I was done with the circle pattern, I decided to play with cutting a shape. Again, I kept it simple just to try it out. 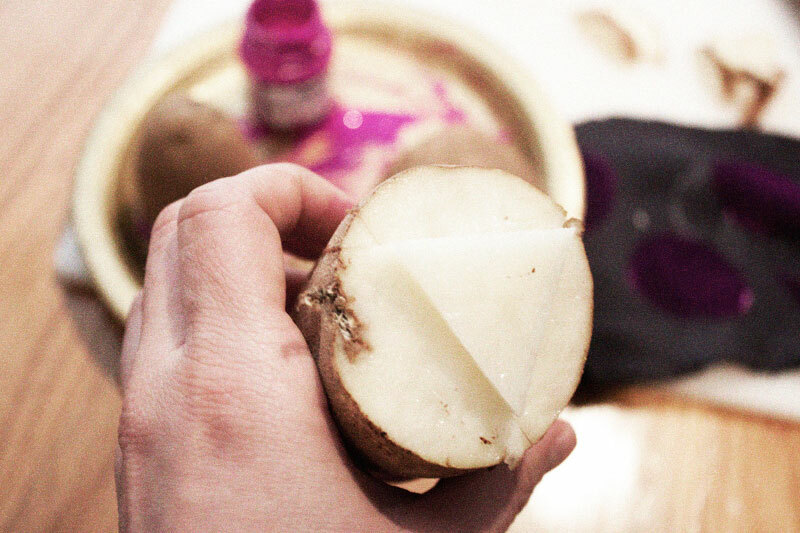 I cut a simple triangle shape in the tater. This time I used white fabric paint, which showed up much better on the fabric. Did I ever tell you I am a messy crafter? (And baker and everything I do...) I gots-a-little paint on the fabric. Be careful when you are stamping that you aren't overloading the stamp with paint, it will drip and flow onto the parts of the potato you dont want them on and could make a mess. After this began to get a bit messy, I started applying the paint onto the triangle stamp with the brush instead of dunkin' it right in the puddle of paint on the plate. I found this helped me control the amount of paint I had per stamp better. Let the paint dry completely before messing around with it. I used my blow drier to speed up the process, and then when I thought it was super close to dry, stuck it in the drier for a few minutes. If you aren't in a rush, just let it sit and dry (I needed to get it done so we could exchange Christmas gifts!). After it is dry, set your iron to whatever temperature your particular fabric calls for. Turn the fabric inside out and begin ironing on the back side of the fabric (that was not stamped directly). Ironing the stamp sets it and allows it to become machine washable! (I haven't tested this out yet but thats what I read on the interwebs, will post an update when I finally test it). Ta-Da! Super easy one-of-a-kind scarf. Luckily, my bestie (who got the one with the circles) is also my roommate, so I can wear that one whenever I want as well! Have you ever tried stamping on fabric? How'd it turn out?